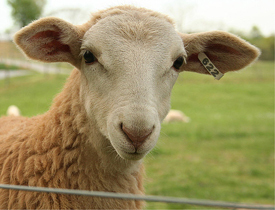 Wool is a natural fabric that grows on the back of a variety of animals. The most popular form of wool comes from sheep and their young, but it is also commonly gathered from goats, alpacas, camels and even rabbits. Thanks to its texture and ability to retain heat, wool has become synonymous with winter wear clothing. The type of wool used to make different types of clothing is usually determined by its ‘crimp’ - the number of unit bends along the particular fibre. The number of crimps found in wool differs by type and each will be measured in microns (micrometers). The density of the crimp determines the yarn, which then determines the items of clothing and products that are made from it. Merino wool is a very fine fabric – measuring between 12 – 24 microns. The most valuable kind of Merino comes from Merino Hoggets (young sheep aged between 9 and 18 months old). For the best quality fabric, the sheep must grow up in a relaxed, stress-free, environment where they can grow a full coat free from breaks in the wool (thin spots). Merino wool is graded based on its diameter in microns and referred to as Ultrafine, Superfine, Fine, Medium or Strong. The Australian Wool Exchange Council (AWEX) will even score wool against a measurement of fineness, character, colour and style – the very best wool being given a 1PP rating. 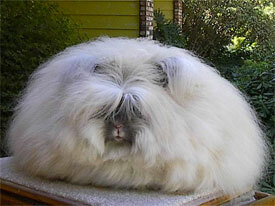 Not to be confused with the Angora goat, which produces Mohair, Angora wool actually comes from the Angora rabbit. This breed of rabbit has a distinctive appearance with big fluffy coat with a silky texture. This fibre has a hollow core, making the wool warm and light. The Angora coat is either white, tan, grey or brown through to black with a diameter of 12 – 16 microns. Used for centuries in Turkey, Angora wool only became popular in England in the 18th century and it wasn’t until the 20th century that the United States caught on to its popularity. As Angora is not naturally elastic, it is often used as mix wool and blended with other fibres to produce a yarn that is easier to work with. While this does diminish the softness and texture of the garment, it still produces a beautifully distinctive finish. Due to its low individual yield, Angora is mainly used for making smaller items like sweaters, gloves and craft items. Mohair wool comes from the hair of the Angora goat. Mohair is a silky fabric that measures between 25 – 45 microns in diameter. It is one of the oldest textiles still in use with its names originating from the Arabic ‘mukhayyar’. Mohair is a tough and durable fabric, that manages to hold a high sheen appearance, giving it the nickname ‘Diamond Fibre’. It is popularly used in fabric blends for this reason. Mohair has become especially popular because it is easy to dye. This is why you often see vivid colours in garments made from Mohair. It is considered to be a ‘luxury wool’ as it is equally adept at keeping you warm in winter and cool in the summer. Mohair fabrics from younger goats is used for clothing as it is fine while thicker hair from older goats is commonly used for carpets and heavy outerwear. Like its name suggests, Lambswool comes from the first shearing of a sheep, at the age of around seven months. To be classified as Lambswool, the fabric needs to be 50mm or shorter. It is soft, slippery and has an extra elasticity needed for high-quality textiles. Due to it’s softness against the skin, Lambswool is an ideal material for making baby clothes. It’s also a natural fire retardant and its ability to absorb damp makes it ideal for home insulation. The material used on a paint roller is often made of Lambswool as are many cleaning utensils around the home. This entry was posted in Wool on August 11, 2012 by admin.